Boxes, burnt wood and plexiglass….oh my! It’s officially been 7 days!! One whole week with the new house…and oh is it trying to tell me it’s story. So, over the weekend, there was a massive cleaning adventure (which, for the record is still going on). We were able to get a lot purged and scrubbed, but it never seems enough, does it?? The first adventure was cleaning these boxes out of the attic. I have no idea who felt the need to throw them up into the attic years and years ago, but thanks. 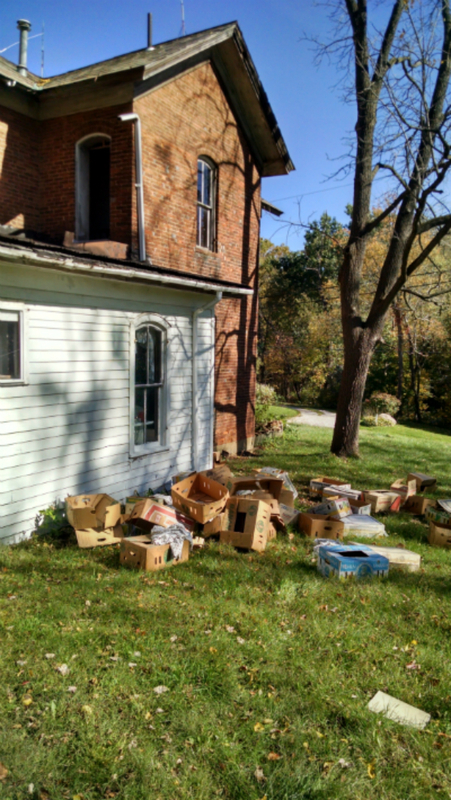 Seriously, nothing like crawling around in cobwebs and raccoon poop because you were worried about saving boxes! 🙂 Truthfully though, my poor brother got the worst end of this deal. I was in the attic throwing them towards the ladder and he got to be on the receiving end. I fear I took a year off the life of his lungs! While looking at purchasing the house, I developed a serious love/hate relationship with the original windows in the house…well, what appeared to be original. The ones that are still original…are AMAZING! The glass in them is almost enchanting when you look through it. They have so much character. I quickly ignored the inefficiency of them and just knew that I would have to figure out a better way to ward off winter then replacing the windows. Well, that was until I started cleaning them. Apparently, over the years, a good number of the windows have been replaced with plexiglass. Now, I’m all about fixing things on a budget. BUT….plexiglass?? The best part, not one of the ones that has been replaced is actually attached on all four sides. This brings me to the hate side of my relationship with the windows. I am already dreading the hours that is going to take to REMOTELY fix the windows…but it will be great when it’s done, right???? 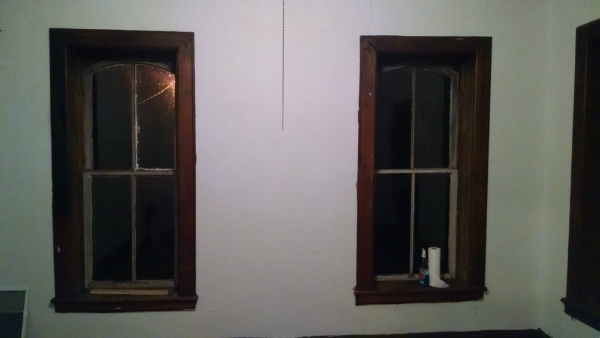 The window on the right is original, and clean (well the inside). The windoow on the left is dirty and mostly plexiglass. Now, to the juicy part of this story. The house has had a fire at some point. From the damage in the above room, it was a pretty good blaze. The amazing part of this is, in the course of the last 6 weeks, I have had a dozen or more people go through the house with me. No one, not a one, noticed the burnt trim in this room. It wasn’t until I was scrubbing walls and trim last night did I even notice it (and I’m slightly obsessive). But it’s definitely burnt. Like a charred piece of campfire wood. It’s not the best picture, but you can definitely tell it’s crispy. It will leave soot on your fingers when you touch it. Bonus! I wonder if they were trying to make smores in bed??? Who wouldn’t want smores in bed? Maybe not the best choice though. 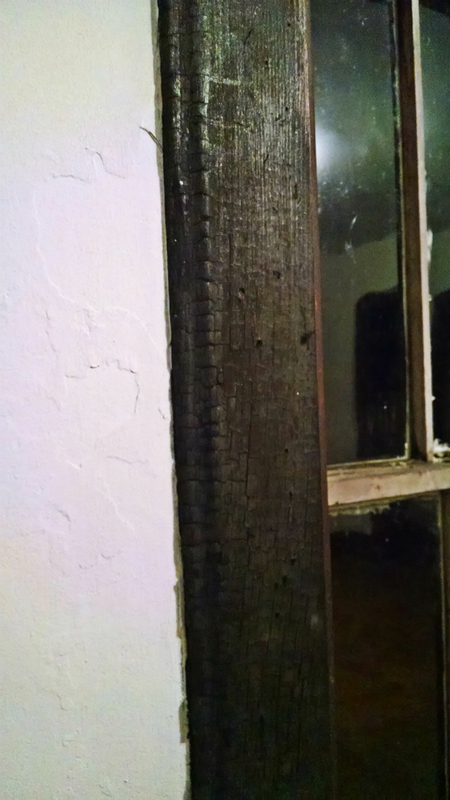 Anyway, I’m sure there’s a tale to tell with this burnt trim. I can only hope to track it down. That story and the fact that I have been told the house was a stagecoach stop once upon a time. Next Article Let’s talk about math.